In the teacher workroom is a box that says, “Art Scraps”. A few years ago, a recycling minded parent created the box for us. Teachers and parents put all the construction paper and other paper scraps from projects in the box. For this project, we used some of those scraps. 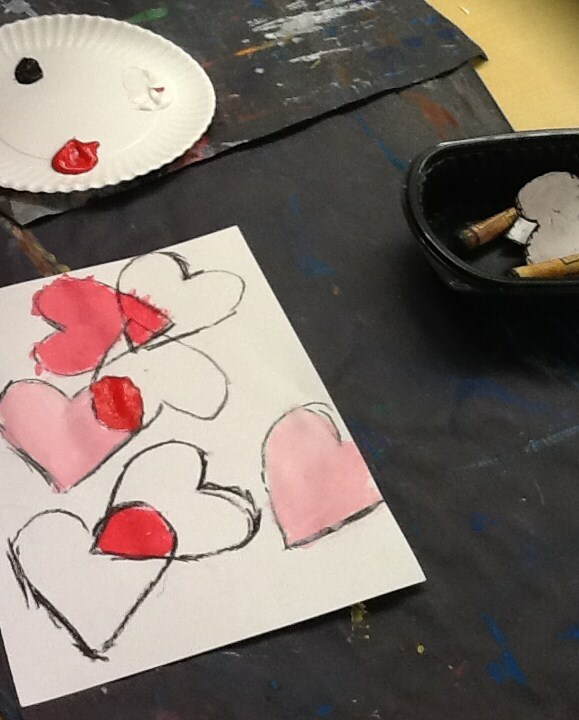 Students in my 1/2 combo class were given heart templates to trace. They then filled the hearts with scraps of paper. I used cups of white glue mixed with water and some sponge brushes that were donated. 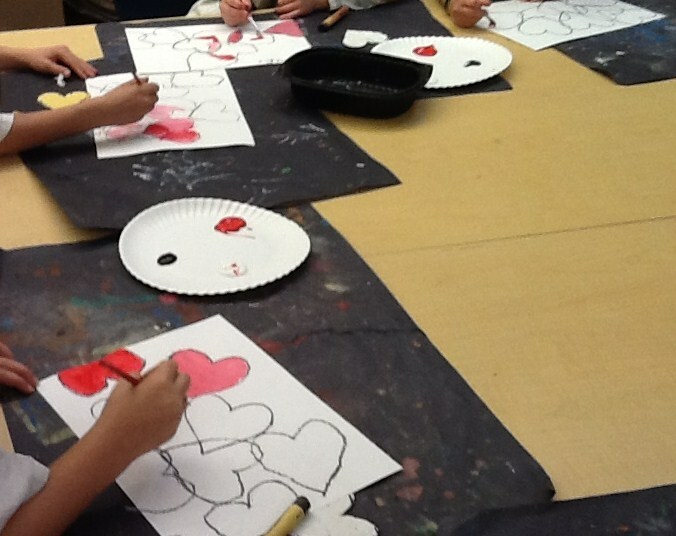 They traced the heart templates with our black Staonal Crayons. They used scissors or tearing to make the pieces of paper smaller. Because they came out so nice, I did the lesson again with my K/1 group. For them I pre-traced the hearts to save time. There is only one class of this combo and it is small. They actually ended up having time to cut the hearts out and glue them onto black paper. I think it is always good for students to have extra scissor practice and the black background really makes the hearts stand out. I went to a CAEA Conference last fall and met fabulous art educators. One workshop I went to was on James Rizzi. The two women who taught the workshop were second grade educators who incorporate the arts into their classrooms on a regular basis. They truly are champions of the arts at their school and in their district. 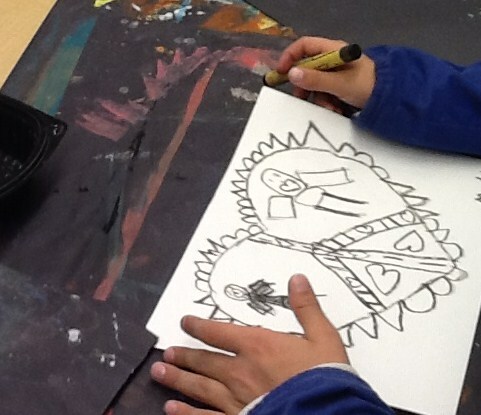 For their workshop, they showed different ways James Rizzi’s art style could be incorporated into various art projects. Remembering that workshop and using James Rizzi as a springboard, this is how I adapted his work for a heart themed lesson. My K/1 students looked at and discussed the work of James Rizzi. I demonstrated how to draw various Rizzi elements. 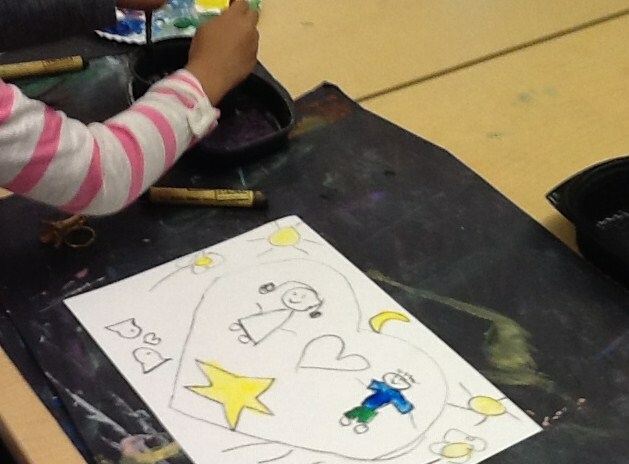 They began with a large heart template and traced around it in black crayon. 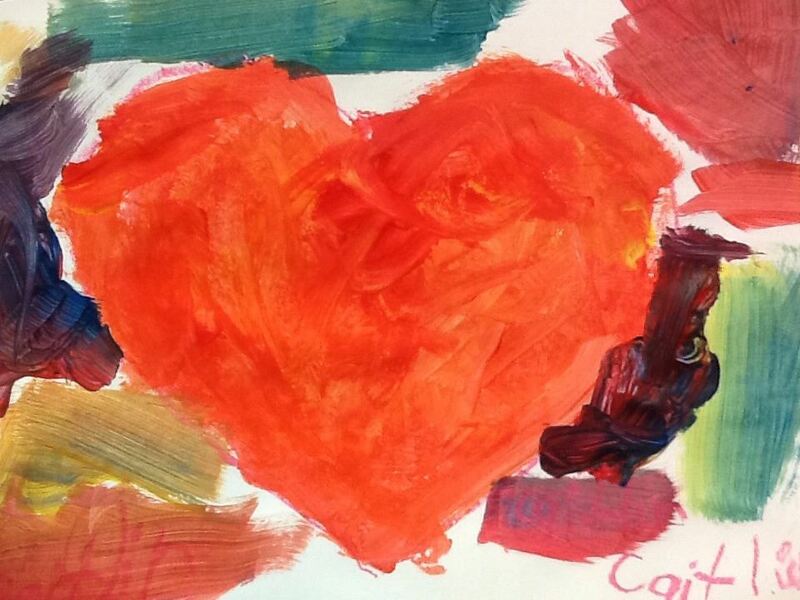 Once the heart was drawn, students could fill the heart with any Rizzi style creature or pattern. The favorites were Rizzi’s “kissie fish” and his birds. Once they finished drawing, they filled in with bright tempera paints. Students learned about the history of the playing card and looked at historic examples of playing cards. We talked about what they noticed in the cards-pattern, line, symmetry and shape. 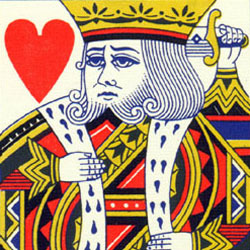 They drew an image of themselves as a king or queen of hearts-a perfect lesson to celebrate Valentine’s Day. A similar project can be seen in the Arts Attack program for grade 5. The challenging part was explaining how to create a symmetrical, upside down copy of the art. 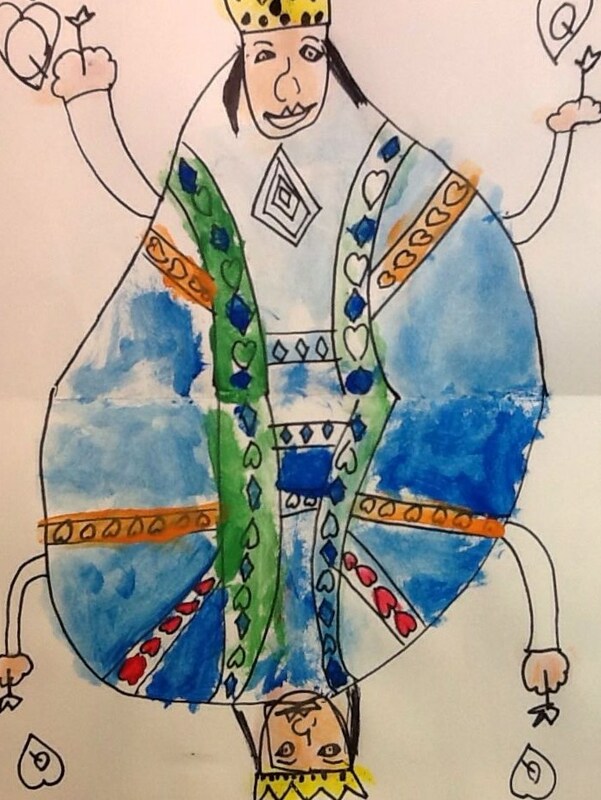 Students first folded their paper in half and drew a king or a queen. To draw the other half, they folded the paper over their finished image and then lifted the paper enough to see the first drawing-then they were able to see where to draw the next lines. 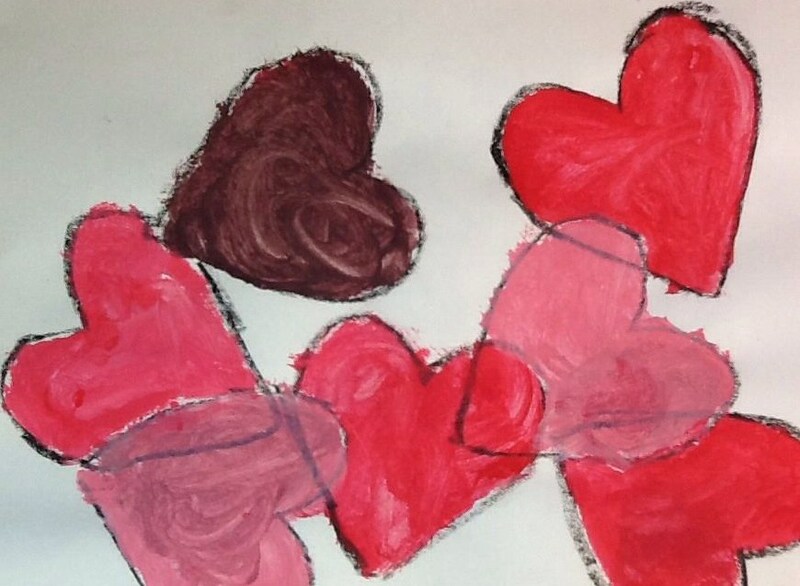 Once they finished their drawings, they painted with tempera paint. I love how very different they all are. 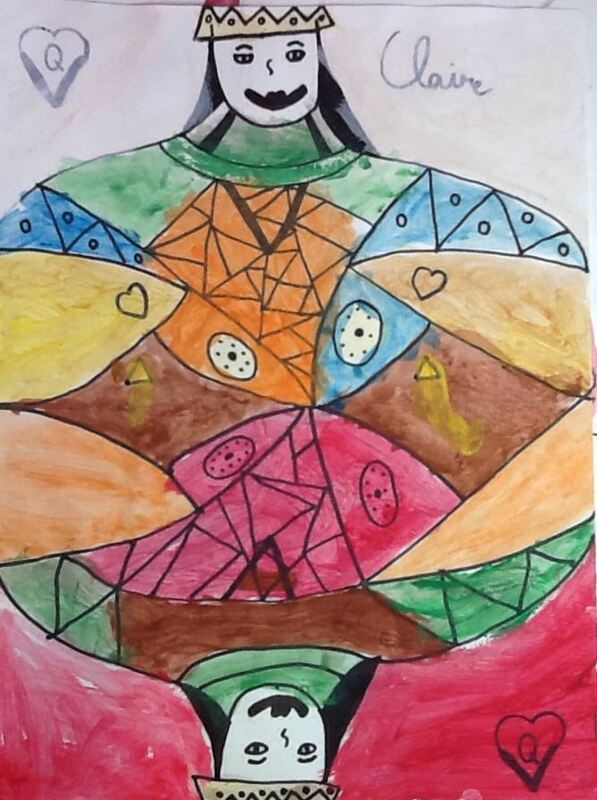 Each child interpreting pattern, line, harmony and balance in their own ways. This student came in late and was only able to complete half which was totally fine with me. Look at all that detail!